But lets rewind a bit to the nature of the recent chatter. The Saudi Energy Minister has indicated that Saudi Arabia, OPEC’s largest producer, is willing to proceed with a production freeze. “We are, in Saudi Arabia, watching the market closely, and if there is a need to take any action to help the market rebalance, then we would, of course in cooperation with OPEC and major non-OPEC exporters,” said Saudi Energy Minister Khalid Al-Falih, reports Reuters. The hopes of reaching an agreement in Doha were scuttled by Saudi Arabia, because it wanted its arch rival, Iran, to participate in the freeze. Unfortunately for oil prices, Iran had made it clear that it would not join any such discussion until they reached pre-sanction levels of oil production. Iran’s oil production is close to its pre-sanction levels, meaning that its first cited prerequisite for any discussion has now been met—a criteria that was not met at the time of the Doha meeting. In addition, increasing oil production further by Iran is a big ask—it would need billions of dollars worth of investments in both upstream and downstream facilities to make this happen. With oil prices languishing below $50 a barrel, major oil companies are reluctant to commit huge sums of money for new oil projects. Iran’s oilfields are mature, and more than half of its wells have an annual decline rate of 9 percent to 11 percent, according to Michael Cohen, an analyst at Barclays in New York. Therefore, at their existing production levels, they need an additional 200,000 to 300,000 barrels a day annually to replace the shortfall from their aging wells. That said, the last thing that Iran wants is to be sidelined, so Tehran is bound to make its presence felt at the meeting with strong statements. But at the end of the day, it is unlikely that Iran will scuttle an agreement where it has everything to gain and nothing to lose. “There may be a little bit more to it this time. I’m still very skeptical, but it’s just with Iran being where they are production-wise, they’ll be more inclined to eventually go along with a deal,” said Again Capital’s John Kilduff, reports CNBC. 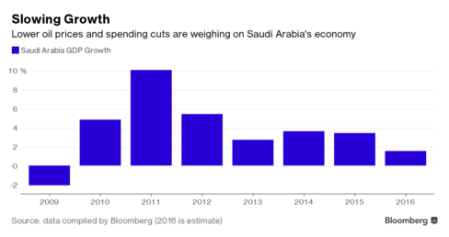 Meanwhile, Saudi Arabia has burned more than $175 billion in reserves since August 2014. The Saudis have introduced austerity measures and plans to monetize their crown jewel Saudi Aramco to survive the oil downturn. Nevertheless, things are not going well for this nation, which youth is struggling to find jobs as shown in the chart below. A large population of unemployed youths who cannot take care of their families can sow seeds of frustration, and the Arab Spring will still be fresh in the memory of the rulers. Saudi Arabia is struggling to grow in this oil downturn. Barring the 2009 dip, the current growth rate of 1.5 percent is the worst in a decade, according to data compiled by Bloomberg. If oil prices remain low, the Saudi plan to sell shares in Saudi Aramco might not fetch them the valuations they expect, and a nation that cannot provide the most basic of amenities—food for its foreign workers—says a lot about their financial condition. Saudi Arabia has seen the recent slide in crude oil prices towards the $40/barrel mark, which could have gone deeper without the chatter of a production freeze. And since they have already cried wolf once in Doha, doing so again in Algiers decrease the importance of any ‘chatter’ leverage they have in the future. Barring Iran and Saudi Arabia, the rest of the nations were in agreement about the need to freeze production during the Doha meeting. With all of this in mind, an agreement between OPEC and Russia is more feasible in Algiers than it was in Doha. It might not mean much though, with output levels soaring ahead of the meeting. A freeze at current levels—or levels reached by the time of the meeting—won’t do much to change the fundamentals, nor is there any indication that a freeze would have long legs.